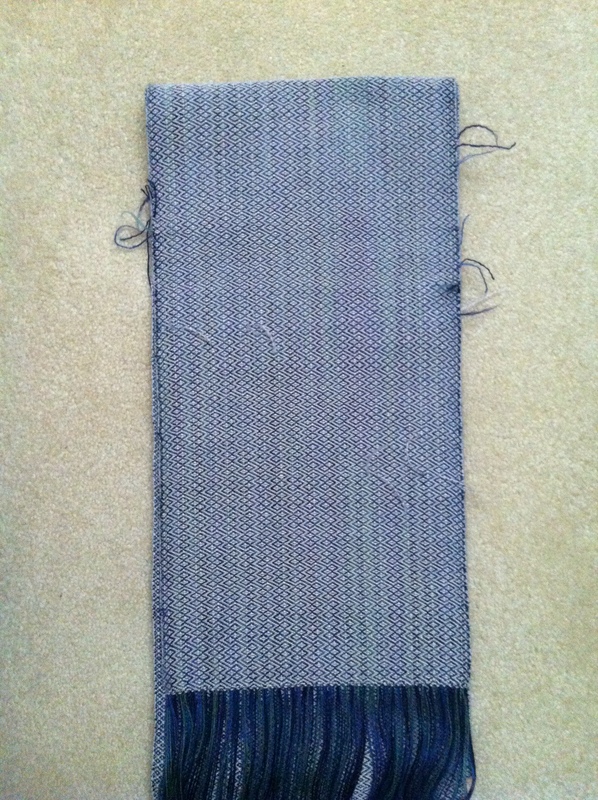 Well, I was somewhat disappointed in the last (Quick Tencel) scarf because of all the warp thread breakage. The edges weren’t completely unsightly after wet finishing, but not great. 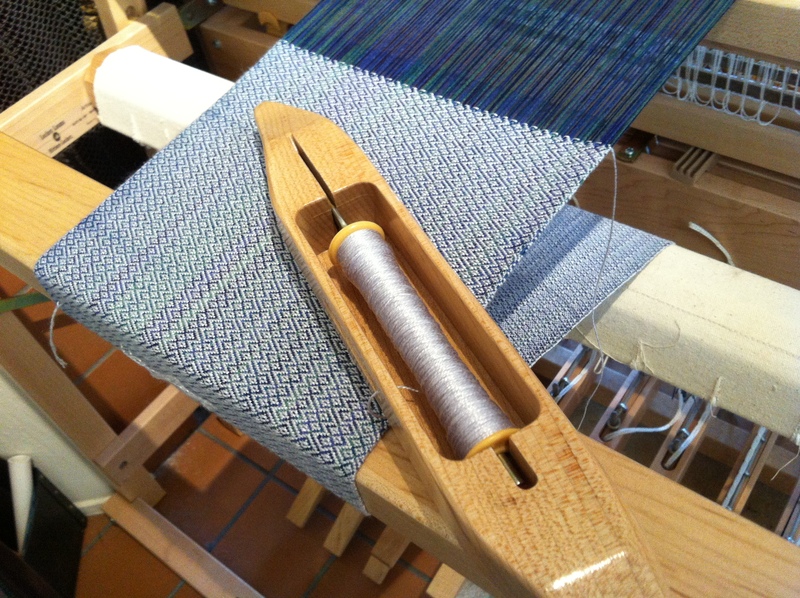 So, there was nothing for it but to conclude that this problem had something to do with my weaving skill, and I set out to figure out what it might be. 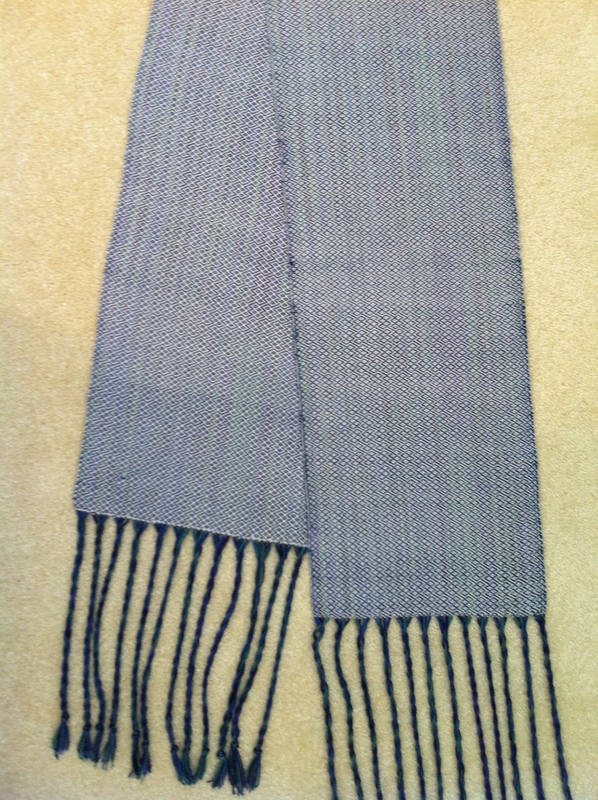 I jumped right back on the horse and warped up another scarf with the same yarn, but reversing the warp and weft. (Structure is Dixon book, p. 198 at the top – undulating 2/2 twill.) I was very careful with the warping process, and didn’t note anything that could be abrading the yarn. When I started weaving, I was a little tentative about it, because the yarn seemed so fragile, so I was not beating very hard. In fact, my beating was so light I stopped to measure the picks per inch (not something I have been too focused on in the past). 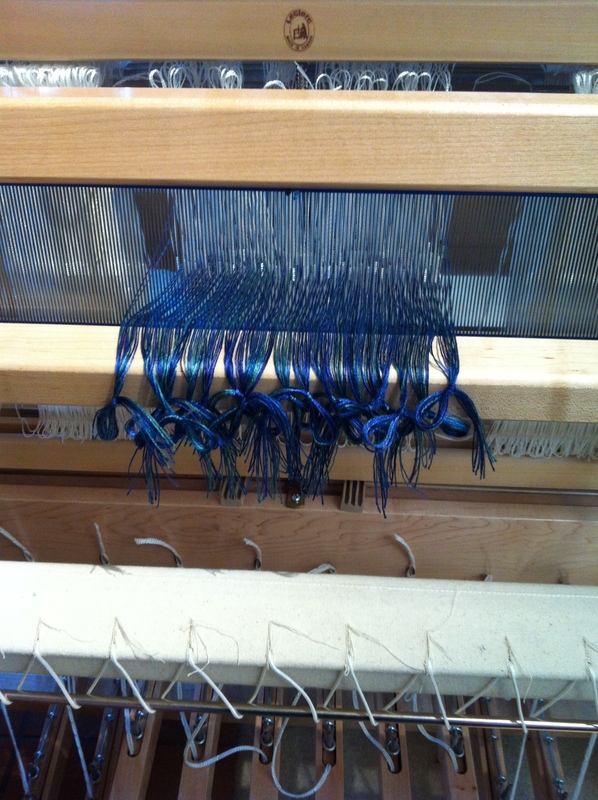 Lo and behold, I was weaving a balanced weave! Could the problem have been that I was beating too hard (and me such a pacifist…)? 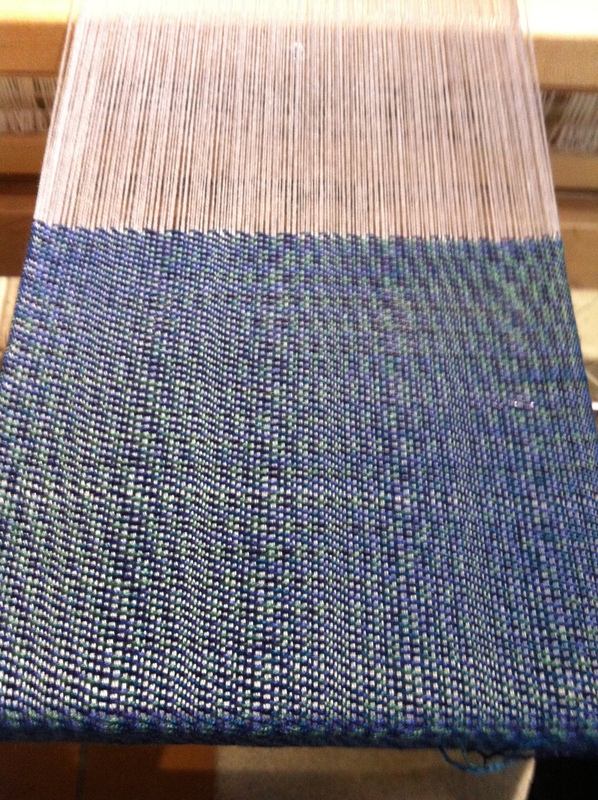 I went to my previous scarf to measure ppi, and sure enough the weft turned out to be packed pretty tightly. Who knew? Could this be the answer? 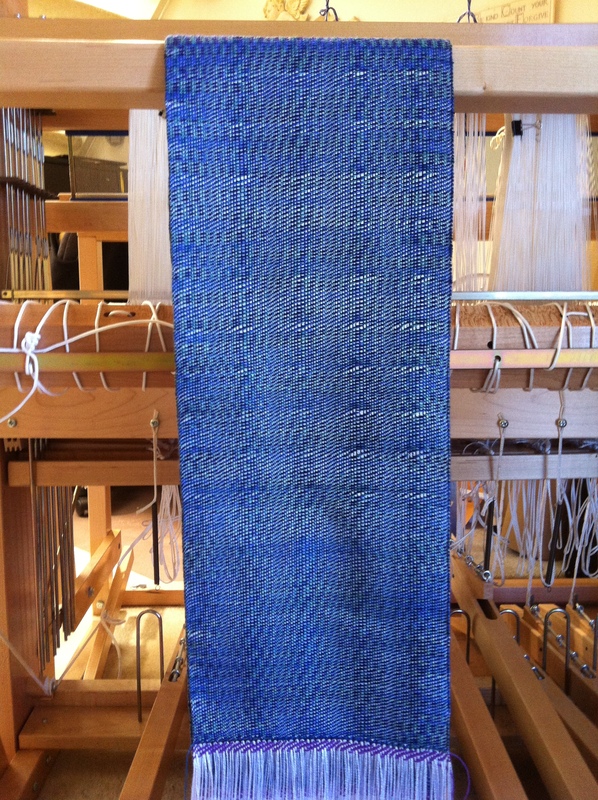 I could hardly wait to see, so I forged ahead, beating lightly and measuring often, and got the scarf off the loom in 2 days – with no breakage!!! Yahoo! Still, there are things to learn. I was pretty amazed at the very slight difference in pressure that would take me from 20 ppi to 24 ppi. Also, with this slippery yarn and long weft floats, the weft got pushed around while going around the breast beam, and left “holes” of warp showing. I’m going to try to fix that in the dry finishing, but am not sure how stable the structure will be in the end, or whether this will turn out to be a design element. So I had a little trouble with warp breakage toward the end of this scarf. This has happened before, and it must be something I’m doing during the warping process. This will be a question for the weaving guild! So, that worked out. Only one friend came, as her sister had a cold, and we had a good catch-up. 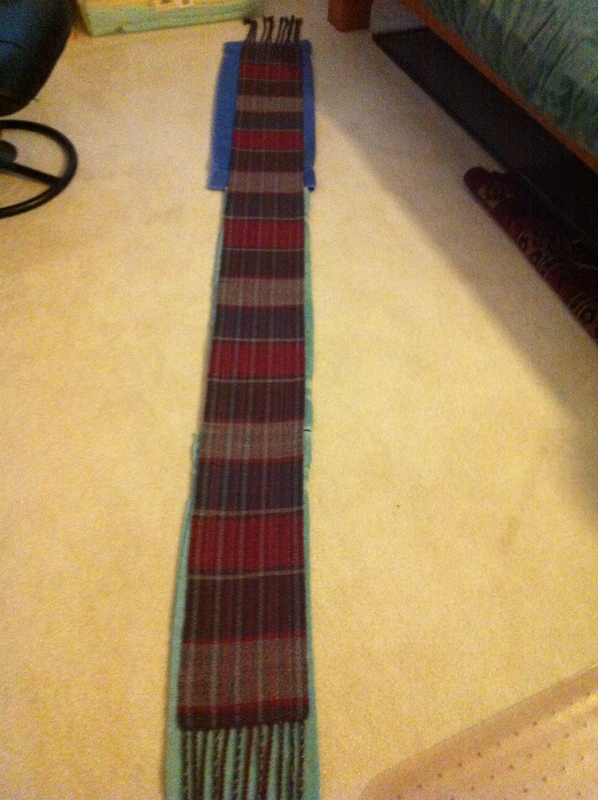 And, I had a respectable amount done on the Tencel scarf so she could get an idea. It wasn’t that long ago that I would have been completely baffled as to how to accomplish such a thing, but once I learned to read a draft the possibilities multiplied, and now I just need to practice my skill. What fun! My friend picked out scarves for the two of them, and of course I forgot to take a photo of her with hers on. I’m really happy with the choices, though. She got a couple of my favorites. First thing this morning I realized that I have some friends coming over on Friday specifically to see my looms and weaving setup, and also to pick out their choice of scarves for themselves. 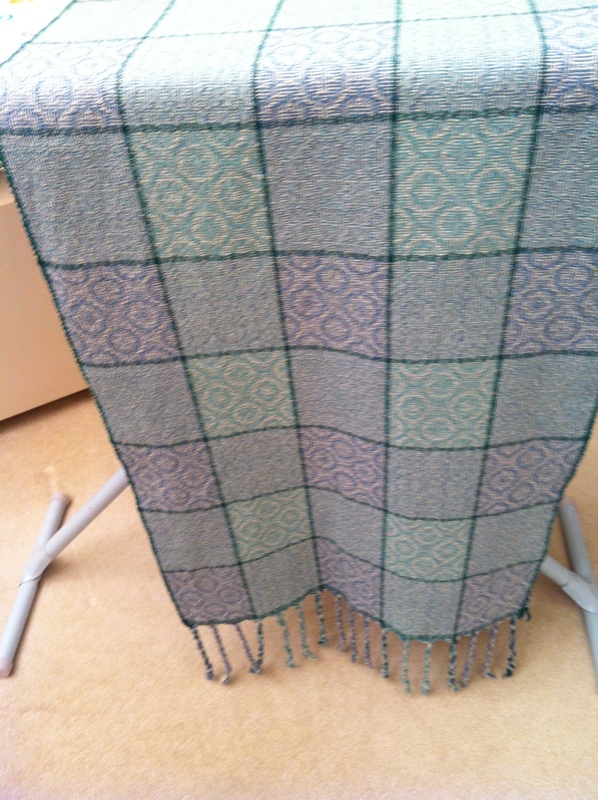 But, there’s nothing on my floor loom to show them – oh no! 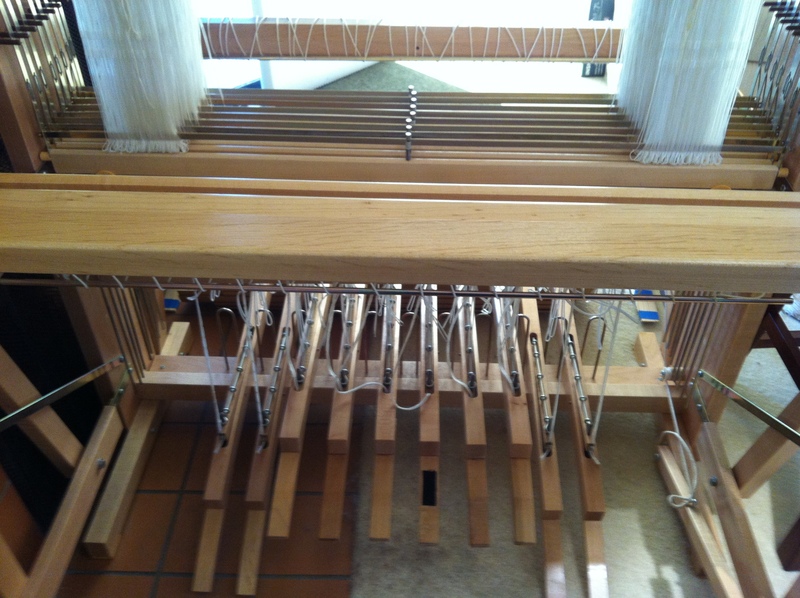 I wound the warp as I drank my coffee, and had the loom threaded and sleyed by 11:30am. Whew! 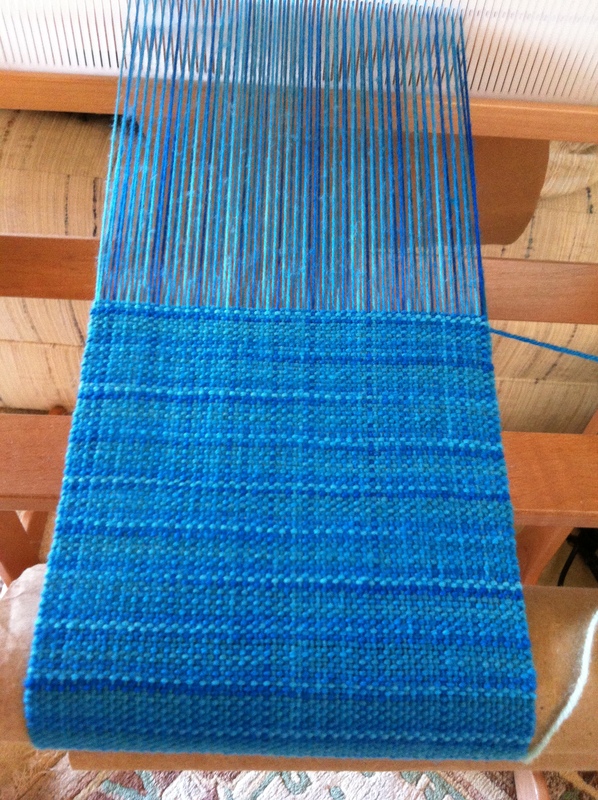 I have been busy the rest of the day, but will have time to weave at least a few inches on this before Friday. Is this fun, or what??!!! The other day, my beloved DP Dan said he wished there was someplace online that people could go to see examples of my weaving. (He apparently talks me up wherever he goes.) Other people have said the same, so I thought – why not set up a blog? Even if I’m the only one who reads it, it will be a record of my thoughts and projects as I continue on this adventure. See the About page to find out how I got here. 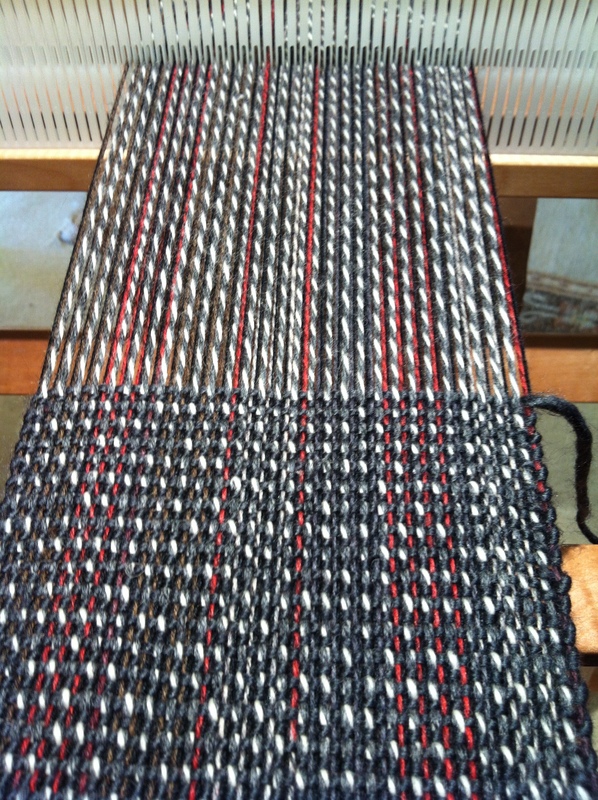 My next floor loom project is a small table runner for some friends. One of the yarn colors is on backorder, so I’ve used the time to get everything planned out (this will be small, but complex – all the more fun! ), and I’m leaving the loom empty so I can start as soon as the yarn comes in. I look forward to sharing my thoughts and adventures, even if it’s just for my own records. I think this will add to the fun!